1. Click Run on Step 3: Prepare Current Forest. The Prepare Forest task launches, as shown in Figure 3. Click Next. Figure 3. Preparing the forest. 2. 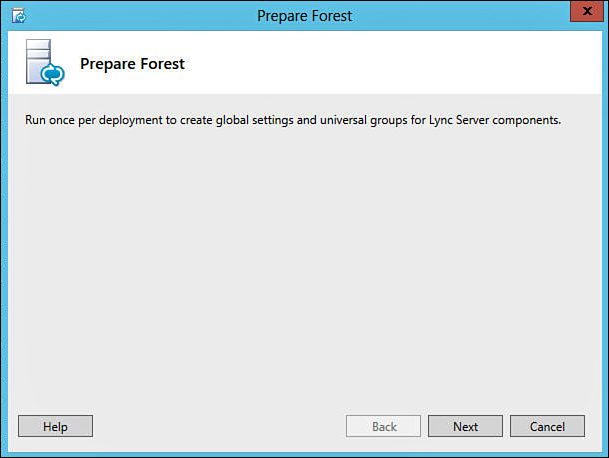 At the Universal Group Location screen, the option is presented to create the Lync security groups in another domain in the forest. Either choose the Domain FQDN option and enter the fully qualified name of another domain, or keep the default setting to create the groups in the local domain. When finished, click Next. This action invokes the Install-CSAdForest PowerShell command, which creates the global configuration settings and universal security groups required by Lync. By default, the Lync installer will create the Lync universal security groups in the domain where the wizard is being run. However, for some organizations it may make sense to select an alternate domain to host these groups. For example, some organizations use an empty placeholder domain as the AD forest root domain. In this situation, one of the child domains would likely be selected to host the Lync security groups to maintain organizational policy. 3. When the command has finished executing, click View Log to review the log file and ensure that no errors or warnings were generated during forest preparation. 4. When finished, click Finish to complete the procedure and return to the Deployment Wizard. 5. Verify that the changes introduced during Forest Prep have replicated throughout the AD forest before continuing with the next step. Replication of the forest prep changes can be verified by simply using the Active Directory Users and Computers console to determine whether the Lync security groups have been created. In the Users container at the root of the domain chosen in step 2, 11 new groups named with the “CS” prefix should be present, for example, CSAdministrator. 1. Click Run on Step 5: Prepare Current Domain. 2. Click Next. This action will invoke the Install-CSAdDomain PowerShell command, which creates the security group access control entries required by Lync. 3. When the command has finished executing, click View Log to review the log file and ensure that no errors or warnings were generated during domain preparation. 5. Verify that the changes introduced during domain prep have replicated throughout the AD forest before installing the first Lync Server into the environment. Replication of the domain prep changes can be verified using the Lync Server Management Shell, using the following command: Get-CsAdDomain. If the domain prep changes have replicated successfully, the cmdlet returns a value of LC_DOMAIN_SETTINGS_STATE_READY. After the Active Directory preparation steps previously described have been completed, a number of new AD security groups are introduced. The groups can be divided into four primary categories: service groups, administration groups, infrastructure groups, and role-based access control (RBAC) groups. The purpose of each security group is described next. • RTCHSUniversalServices—Includes service accounts that can be used to run the Front End services and grants Lync servers read/write access to Lync Server global settings and Active Directory user objects. • RTCComponentUniversalServices—Includes service accounts that can be used to run Lync conferencing and web components services. • RTCProxyUniversalServices—Includes service accounts that can be used to run a Lync proxy service. • RTCSBAUniversalServices—Grants read access to the Lync deployment for survivable branch appliance installation. • RTCUniversalServerAdmins—Allows members to manage server and pool settings. • RTCUniversalUserAdmins—Allows members to manage user settings and move users from one server or pool to another. • RTCUniversalReadOnlyAdmins—Allows members to read server, pool, and user settings. • RTCUniversalSBATechnicians—Grants read access to the Lync deployment, as well as local administrative access to a survivable branch appliance during installation. • RTCUniversalConfigReplicator—Allows Lync servers to participate in replication of the Lync configuration. • RTCUniversalGlobalWriteGroup—Grants write access to global settings for Lync Server. • RTCUniversalGlobalReadOnlyGroup—Grants read-only access to global settings for Lync Server. • RTCUniversalUserReadOnlyGroup—Grants read-only access to Lync Server user settings. • RTCUniversalServerReadOnlyGroup—Grants read-only access to individual Lync Server settings. • CSAdministrator—Grants full administrative access to the Lync Server 2013 environment. • CSArchivingAdministrator—Grants access to the archiving-related Lync settings and policies. • CSHelpDesk—Grants read-only access to Lync user properties and policies, along with access to specific troubleshooting functions. • CSLocationAdministrator—Grants access to the E911 management functions of Lync. • CSPersistentChatAdministrator—Grants access to the Lync Persistent Chat admin cmdlets. • CSResponseGroupAdministrator—Grants access to configure the Response Group application within Lync. • CSResponseGroupManager—Grants access to manage limited configuration of Lync Response Groups that have been assigned. • CSServerAdministrator—Grants access to manage, monitor, and troubleshoot Lync servers and services. • CSUserAdministrator—Grants access to enable, disable, and move Lync users, as well as assign existing policies. • CSViewOnlyAdministrator—Grants read-only access to the Lync deployment for monitoring purposes. • CSVoiceAdministrator—Grants access to create, configure, and manage voice-related Lync settings and policies.